Magnetite is one of the three common naturally occurring types of iron oxides. This mineral is what you would call ferromagnetic, meaning the opposing magnetic moments of the atoms are uneven, and, as a result, spontaneous magnetism occurs. This is why magnetite is attracted to magnets and can even be magnetized to become a magnet itself. 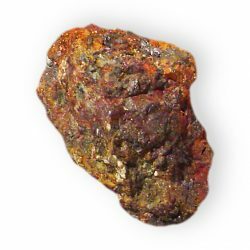 Commonly known as Lodestone, this rock is the only naturally occurring mineral that is a natural magnet. Magnetite is often used as an indicator mineral for certain ore deposits, particularly those from hydrothermal vents. It is also used for catalysis in the industrial synthesis of ammonia, as a coating for industrial steam boilers due to its stability at high temperatures, and used to absorb arsenic (III) and arsenic (V) from water. Pregnant women and people with pacemakers or defibrillators should not wear this stone without advice from a doctor.